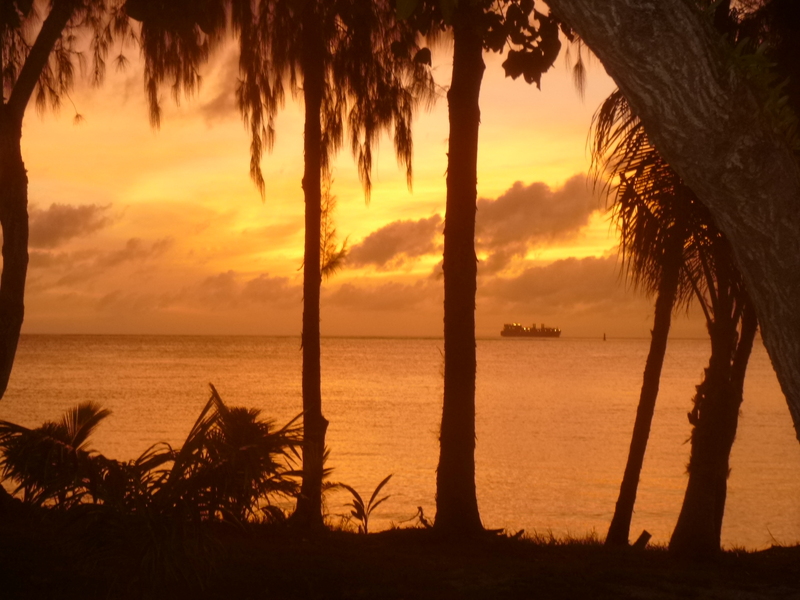 Clarissa, who did the interview with me last week, called first thing this morning and invited me to a Philippine dinner tonight for my last night on Saipan – so that’ll be a fun way to end my adventures in the territories! She also told me the article she wrote would be published today and that she’d bring a copy of the newspaper to dinner. I set out this morning to take care of donations. Over the weekend I had emailed a lady about a 4-H club on Saipan. When I was out walking, I had noticed a big building near Susupe that had a 4-H sign on it. But there was also a farmer’s market sign on the building. I had no idea the 4-H program reached this far, and I thought it would be a fun donation, so I managed to find a contact person. There hadn’t been a response to my email, so I called and tracked her down. It seems most of the 4-H projects are held through schools, and the lady I talked to was honest about nothing happening right now with any 4-H projects, so she didn’t feel it would be right to accept a donation – even if it was for something in the future. I appreciated her honesty, and had something else lined up just in case. 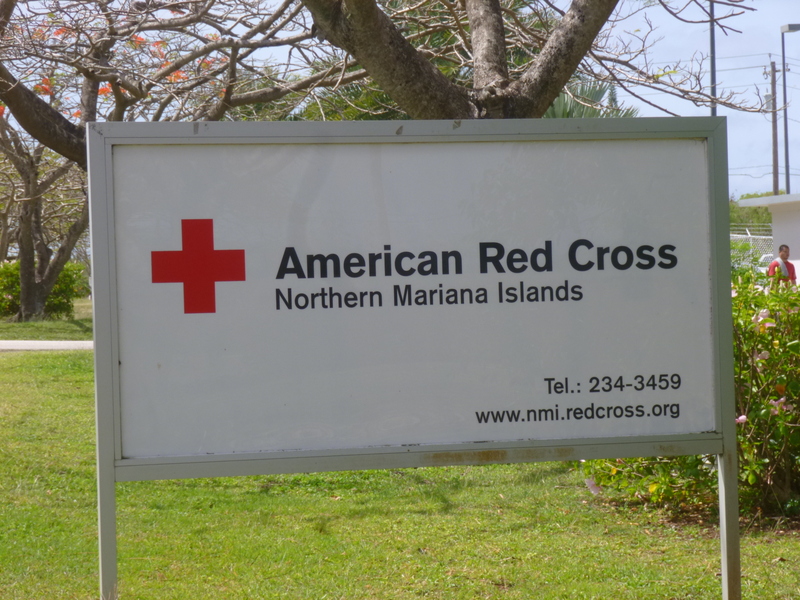 I got in my rental car and drove down to the south end of the island – I had noticed the Red Cross office was by the airport, and that’s where the first donation today went. I found the building, which looks very old, and went inside and met John, the director. He told me that because the building is located in a historic district, they are not allowed to do anything to the outside of the building, but can do what they want inside. 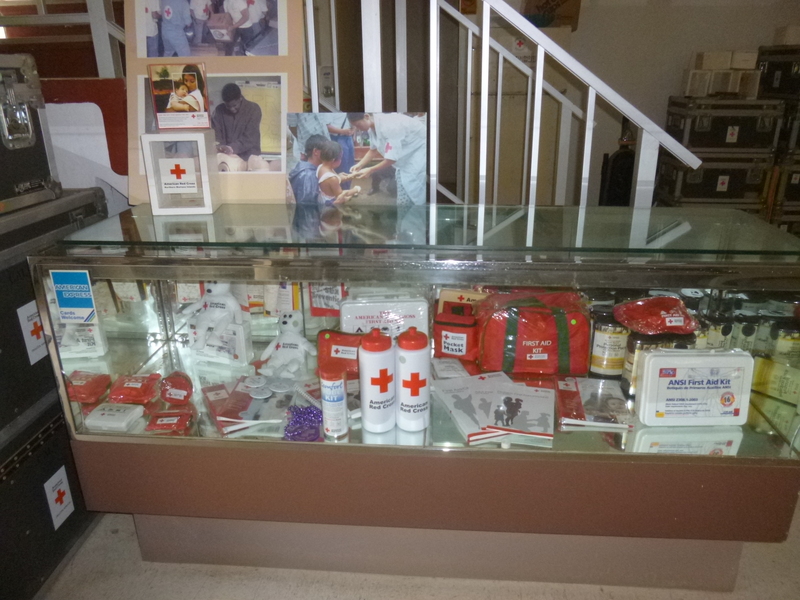 There were offices upstairs, and a display case of old interesting Red Cross memorabilia downstairs. 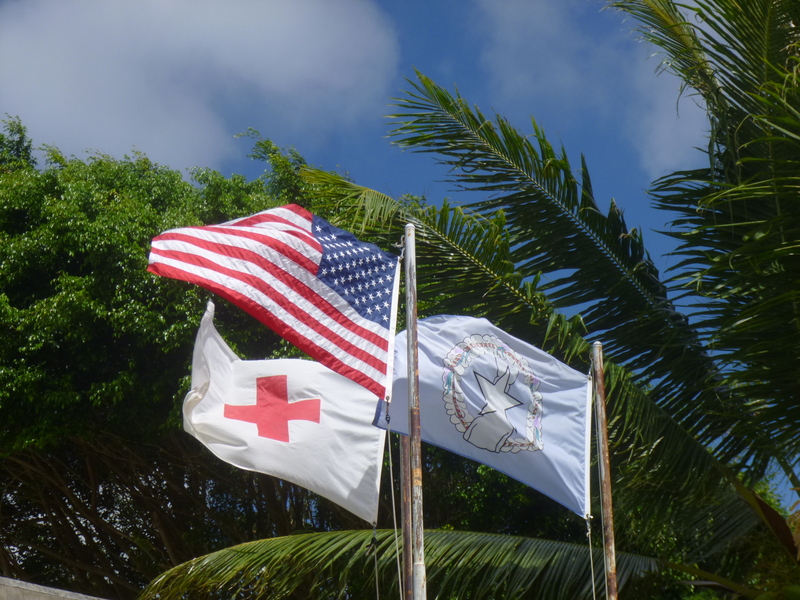 Unlike American Samoa, Saipan hasn’t had to cope with a major natural disaster for 8-9 years. 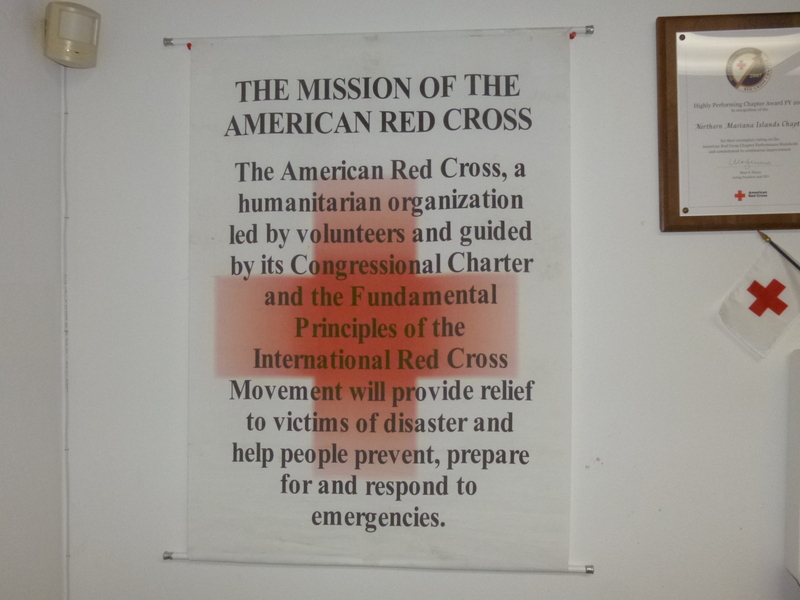 But they’re ready for whatever might happen, and in the meantime have other things to organize like swimming lessons and lifesaving classes etc. 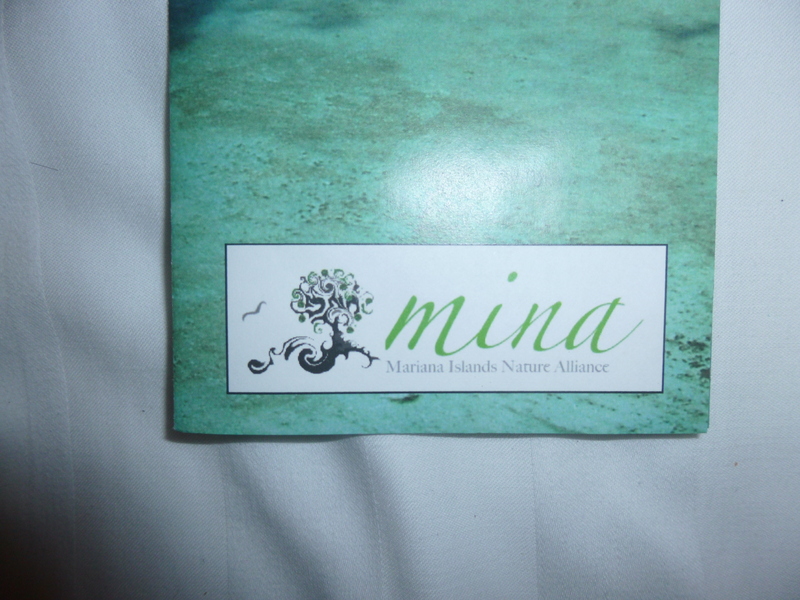 After the Red Cross, I drove back to Garapon and found the office for MINA, which stands for Mariana Islands Nature Alliance. This is an organization that Clarissa had suggested – and I was happy to be able to make an environmental donation – overall, I haven’t done as many environmental donations as I thought I would. The lady I met told me more about the program, and how they’re trying to increase community awareness about their rich natural resources, and how to protect and restore them. They get school kids involved with cleanups and are trying to eliminate the use of plastic bags. It was nice talking with her, and she gave me some t-shirts from past events. Then I drove back up to the north end of the island – I wanted to walk the last bit of the walk up Suicide Hill – to finish where I left off yesterday! I parked at the top, and told the guard I was just going to take a short walk down the hill a ways, and would be back in 20 minutes or so. He had been reading a newspaper, and he looked at me and back at his paper, and recognized my picture in the paper! He asked me to autograph the page – hahaha!!!! I took my short walk and talked with the guard a bit more. 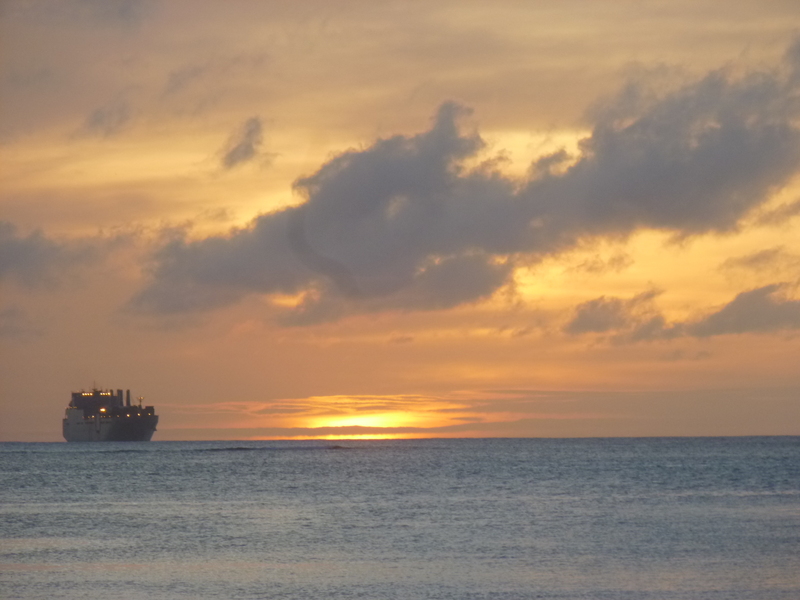 I drove around a little bit more – the time on Saipan ended up going really fast. It didn’t seem like it should be time to be packing up. 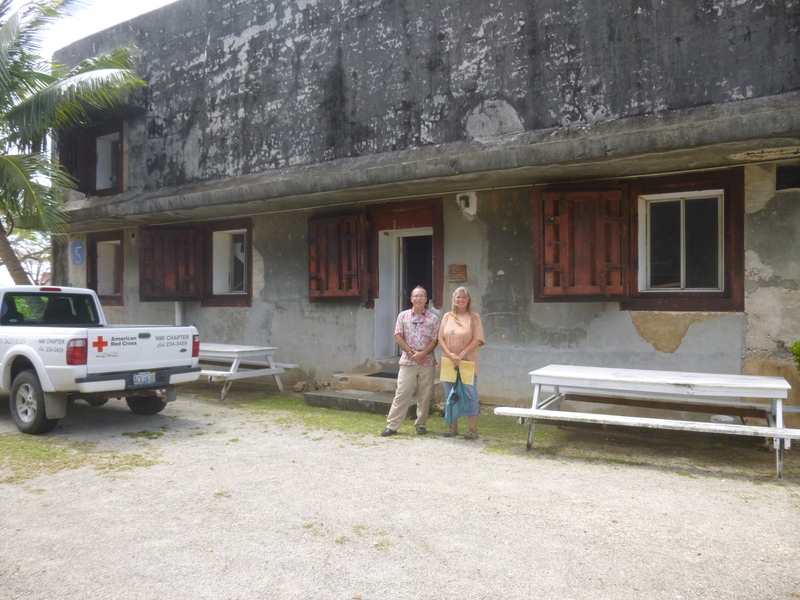 I stopped at the Northern Mariana museum which several people told me I should see and it had been closed yesterday. I was disappointed to see a sign on the door saying they were closed today too due to leaking water from the air conditioning – they needed to make repairs. I called Annie when I got back – she had asked me to call before I left, so I filled her in on the rest of my weekend. I was finishing up her dish cloth, and she said she had something for me, so we agreed to meet briefly a little later. Then I returned to the national park one more time to say bye to the rangers. They had been really helpful during the week. 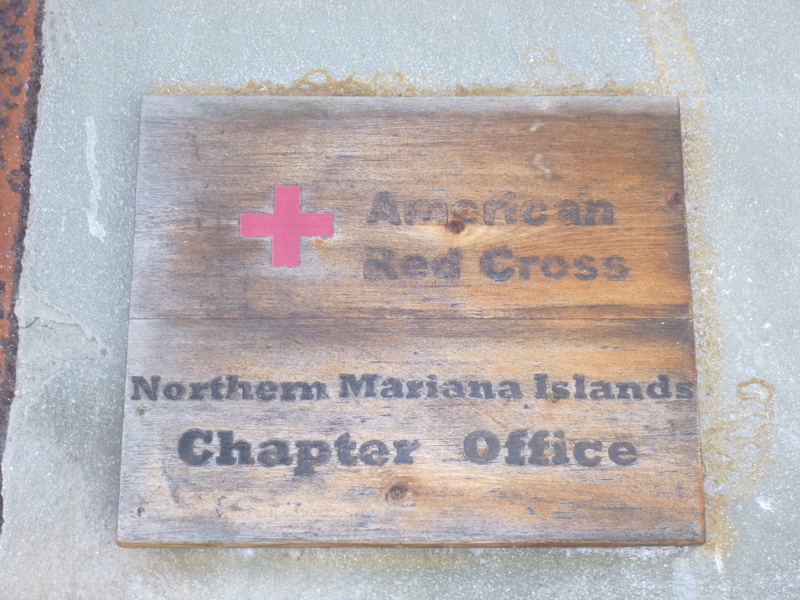 I gave my final Saipan donation to Susan, for Friends of the Arts. She is the director, and they present 3 (maybe 4?) shows a year. It sounds like the people on Saipan don’t typically attend a lot of cultural events like that, and Friends of the Arts is trying to change that! And, having owned a dance studio for so long, I’m always happy to support the arts! From there I walked on the national park trail through the woods and by the ocean, and figured I better go wading in the Philippine Sea while I could. Then back at the hotel, Annie stopped by with a couple of her grandkids. They had used pipe cleaners to make a flower for my hair, and a matching one for Tula’s collar, and one for each of my daughters – so sweet! And Annie gave me a bag with a guardian angel pin, a journal, a pen, a Saipan coffee mug and some bananas and tangerines. Such a nice family! 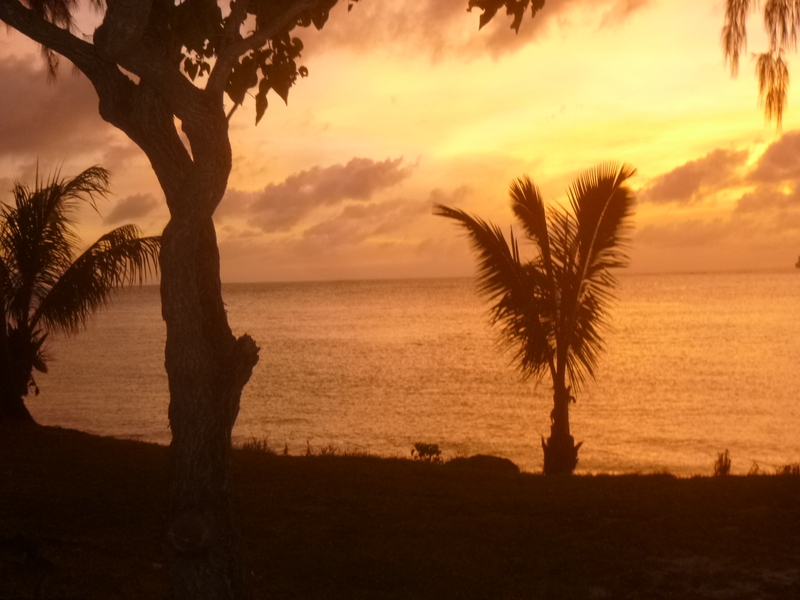 I wanted to walk my last few miles in Saipan along my favorite path by the sea, and timed it for sunset. I’m feeling very bittersweet about leaving – it’s been a special week and I’ve met a lot of good people. I imagine part of it is realizing the whole Pacific territory adventure is nearly over (I have one more day on Guam) and that I’ll probably never be back. Once the sun was down, I made a quick trip back to one of the markets for a couple more souvenirs, and dashed back to the hotel to change. Then I met up with Clarissa at one of her favorite little Philippine restaurants. I took her recommendation for dinner, and did not understand the order, but we ended up sharing a huge bowl of some kind of soup that had big pieces of pork in it, and green vegetables and it was in a delicious tamarind broth that was so flavorful it made the appetizer soup seem bland. They served the soup (I’m not sure what it was really called – not sure soup is right! )with rice on the side, and the broth was good with the rice too. Clarissa told me a bit about growing up in the Philippines and the crowds in her home town of Manila – she prefers the more peaceful island of Saipan! She also told me that up until 9-10 years ago, Saipan had had a big garment district and many of the big designers had their clothes made on Saipan – but they moved ther operations to Asia where the labor was cheaper. 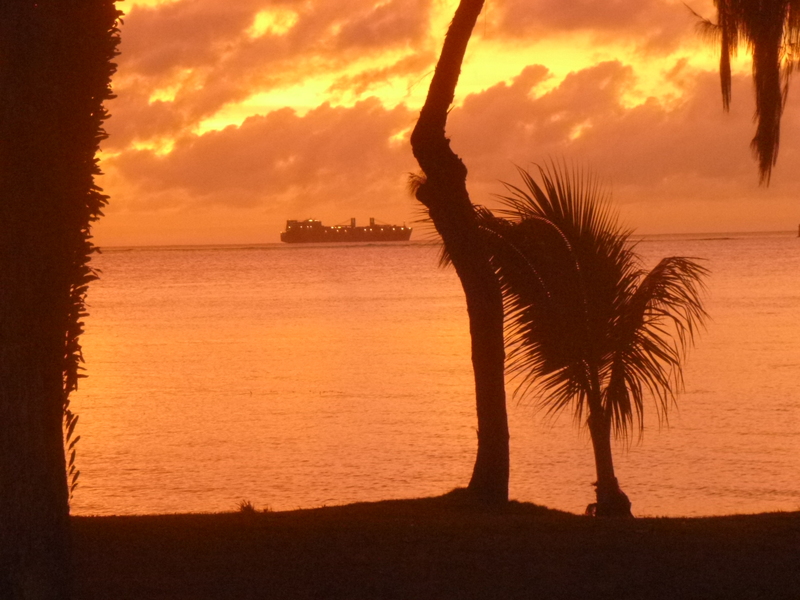 Needless to say, that left a hole in Saipan’s economy. 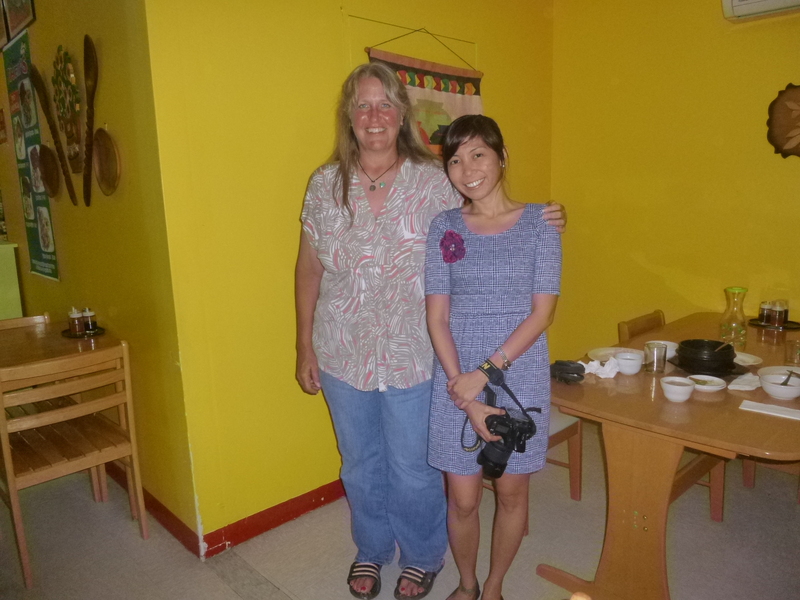 And we talked about traveling – she hopes to go on a long backpacking trip in Asia someday. It was a wonderful dinner. Then it was time to deal with the dreaded packing for a morning flight back to Guam. It was hard to believe that just 7 days ago I had landed on Saipan not knowing anything about it, and since then I had found my way around the island; walked all 56 miles; met a lot of wonderful people; and made all 7 donations – the American Memorial National Park, the Karidat food pantry, the Guma Esperansa Women’s Shelter, Guma Yo’ Ase (Salvation Army House of Mercy), the Red Cross, MINA, and Friends of the Arts. What a week it was!